How to delight the kids in the neighborhood – Trees & Flowers & Birds! 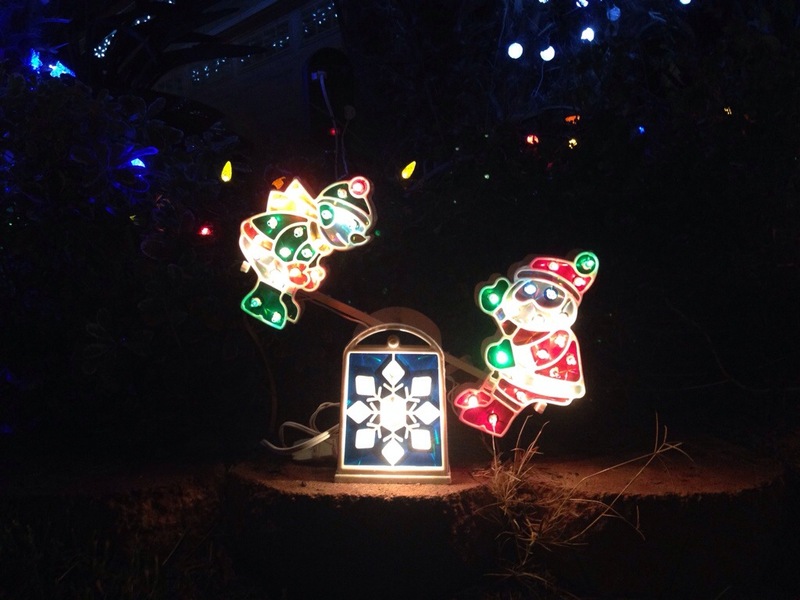 Make sure your outdoor light display includes animated figurines & twinkling light strands. Two boys down the way have been WAITING for my lights to go up. Last night I got home from work to see their dad out walking with his boys all around my corner lot as they pointed & smiled with glee at each turn. Their favorite is definitely this old school teeter totter. It’s a challenge for them not to touch it 🙂 I loved that when I got out of my car they came running to take me around and point out the snowman! And the penguin! And the twinkling candy canes!! Oh, and then the older one (3) took my hand to rather somberly take me to the farthest end shrub where two displays hang. The twinkling Christmas tree ornament was fine, but the candy cane? Oh, it wasn’t working, and he was VERY concerned. I fiddled with it, but it’s about 10 years old & was clearly quite done. So I took it down & promised Zach that I would find a new light. Tonight I bought a lighted Santa and placed it where the candy cane was. Hopefully tomorrow when I see Zach, he will be happy to see the new lights. I may not have little ones at my own house who get that sparkle in their eyes at Christmas anymore, but I do love seeing how much joy the light display brings to the little ones on my block. F*ckin’ remarkable issues here. I’m very satisfied to see your article. Thank you a lot and i’m having a look forward to touch you. Will you please drop me a e-mail?